The early churches of Yeshua or Jesus were urban churches. Yes, Jesus’ teaching began in the rural towns of Galilee, but the early faith spread as an urban movement. The early churches of Yeshua or Jesus were urban churches. Yes, Jesus’ teaching began in the rural towns of Galilee, but the early faith spread as an urban movement. The composition of the early church resembled the population of modern cities in many ways. Popular media-formed opinion associates modern Christianity with rural backwardness. Faith seems to be a more prevalent part of every day life in small town and rural America. This perception is but ONE more sign that what is recognized as the Christian religion today does not evidence full substance of being the faith movement that rocked the world of ancient Rome. As in the great metropolises of the Roman Empire, the true modern expression of faith in power will be predominant in the modern urban complex because the needs of city dwellers are the most urgently dire. They will rejoice in the full expression and experience of God's grace, which will wonderfully arise from their participation in unleashed fellowship with God. It will heal a person’s diseases of the soul, many of the body, and moderate most social ills, but success only spiritually arises in ONE person at a time. Many have sought to release the power of God evidenced in the early church by imitating early church practices (ritual and liturgy) and by adopting a doctrine as literally derived from the New Testament as could be proved. The principle weakness of this approach lies in the fact that ancient social practices do not necessarily evoke the same spiritual responses today as they would have then. Genuine Godly faith is not a Christian magic. The verbal and behavioral repetition of certain ritual words and objects cannot manipulate the powers of the universe to perform upon command of a Christian wizard or witch. Godly faith is an exercise of life in accordance with the will and purpose of an ineffable spiritual Ruler. Therefore, any search of the early church practices and beliefs should orient towards the recreation of the depth and quality of the early church's repentant response in the complete acceptance of God's forgiveness. In other words, God’s forgiveness of sins’ consequences based on His written covenant promises as empowered by Jesus’ sacrificial death and resurrection was more real to the first disciple-members of the early church than to us moderns. For more than the past thousand years, the vast majority of people calling themselves Christian did not perceive and live by the reality of God’s gift of grace to all who believe in faith. We have all become desensitized to the realities of the gospel as a result of its very successful flooding of public consciousness to superficial depths. The basic formulaic of Christian salvation has become so pervasively common in popular western culture that the typical response to the messianic promises and obligations regarding eternity is, “So what?” Overcoming churchianity’s desensitizing mantras such as “Jesus died for your sins” should help us in a replication of the early church’s spiritual experiences and comprehension of God in a manner more resonant with the New Testament and other historical/cultural evidence. Some of the ways to approach the New Testament quality of experience will be suggested later in this book. The viability of any ONE approach will lie in the fruits for those who patiently seek to apply the principles of present grace in a mystical fellowship of forgiveness with others. Such fruits are the universally desired love, joy, goodness, health, and peace. By them you shall know when you are on the right mission trail for you. Over the past few years the United States has experienced repeated occurrences of (most dramatically young) individuals or small groups violently attacking their own families, known coworkers and/or fellow students and teachers with guns and other instruments of death. Why were these deadly mission trails chosen and followed? Are these events merely isolated occurrences, or are they symptomatic of a broader malaise that most of us have simply accommodated less violently? The air of spiritual desperation has seemingly grown so intense that some of us will do almost anything, go to almost any extreme in order to "get help.” The social symptoms are nearly universal. Psychospiritual and chemically dependant addiction are rampant. Some commentators report that two thirds of the world’s illegal drugs are consumed by Americans, who make up only 4% of the world’s population. Anyone addicted to something illegal takes risks of life, limb, fortune and fame to irrational extremes in search of an adrenalin-driven high that remains psychobiologically temporal. These desperations do not satisfy for long even though they arise from internally generated hormones. Others do something – anything - to draw attention to themselves to try to bolster an independent and worthy personal existence in the face of a public, mass media projected world overflowing with endless parades of strange and beautiful people who possess some advertised distinction and receive the wealth and fame felt missing from a viewer's own life. And so we become conscious of an empty purposelessness. It is a real void, and it will be filled. The question is with what? Tragedies like the shootings at Columbine High School demonstrate that some persons respond extremely to stressful social or familial environments, while others find expression in less radical psychological strategies of self-identification, such as radical hairstyles, unusual hobbies, dramatic dress, outrageous make-up and alternative music preferences. This drive for a self-creating identity is the primary expression of our deepest and most universal, natural human force - self-preservation. Besides the fact that each of us differs in our ability to handle specific stresses and temptations, these rather diverse ways of crying out for help belie their rather commonly similar cause. Although some are more sensitive to the supply of specific expressions of loving support and attention than others, an undeniably universal human requirement for sane productive living is the personal experience of an elemental, deeply secure understanding knowledge that we are loved for who we are otherwise there is nothing to balance the insecurity with which each person is born - a natural fear of the mortal consequence of life, which is certain death. Excesses of many kinds often arise after years of economic and political stability. Prosperous abundance makes possible and leverages excesses of many kinds. Some have written that there has never been a country like the United States of America in which so much wealth has been accumulated and enjoyed by so many. Even our statistically defined "poor" or "economically challenged" look well-off in comparison with the middle class of many countries. Lacking external threats to mortal well being, we create internal ones. For most people these crises are always personally dramatic, but most of the time, they do not attract media focus. A thirst for instant celebrity drives too many to one excess or another. For example, evidence for an unfulfilled void, a cry for love and attention may be found in those involved in complex chains of sexual relationships. Such behavior belies an unsatisfied search for an intimacy, which if seemingly found destroys the state of being originally sought. For example, truly satisfying sexual intimacy is destroyed by experienced multiplicity. Others may join a gang or other non-traditional club of the social fringe in a search for the security of individual recognition with its defined rights and obligations within a larger social unit. Self-determination is surrendered for inclusion with a real family that "cares," a social state self-defined by the group. No different are the degreed and licensed professionals who join industry associations or affinity groups that focus on some hobby interest. Humans search for confirmation of who they are uniquely from groups of identified peers. We internally demand acceptance and affirmation from one another through a chosen, narrow slice of social group identity values/mores and activities. The broad principles at work here equally apply to Alcoholics Anonymous, Daughters of the American Revolution, the GLBT coalition, the dental services industry or any political party. Though none of these groups are related to one another, some are linked by individuals who are members of more than one group. Then there is the ubiquitous march of media celebrities, acquaintances and friends who are "victims" of the various forms of chemical abuse. Rather than help our neighbors through such problems, we as a nation increasingly rely on the state to administer its form of "tough love" through the legalism by the courts and prison system. Government institutionalization is a poor substitute for the forgiving love of family, church and God. The former never fully heals, rather it spreads the problems. Enforced secular solutions perpetrate the underlying spiritual causes of unfulfilled love, of an identity not valued. Furthermore, legalism creates a captive dependence on the state by pandering to the public's fears for physical security. For its protective services, the government in turn demands the payment of increasing amounts of our earnings, surrender of our civil liberties and privacy. These demands infringe on our God-given rights to choose who we are and to be who we are by determining the course of our personal experience on earth. In modern western civilization, the pursuit of wealth has become the definition of the pursuit of happiness. Materialism has thereby supplanted the love of life, and for lack of the free administration of Godly love, we are rapidly losing our liberty. In addition to mass murder/suicide, the extreme symptoms of an identity crisis problem could include almost any petty crime, suicide, drug dependence, or even an extreme expression of cultural violence such as "ethnic cleansing.” Regardless of the specifics, each of these violent events is simply a different form a genuinely generated, similarly evoked very loud cry for help that has been ignored for so long that it may now be too late if even heard. These extreme exhibitions of disparate personal identity implosion are symptoms of a society sick on empty values brought on by self-centered materialistic escapism. We invest our time in specialized professions and the accumulation of high status and significant wealth instead of investing in honest relationships with each other, beginning with our own families. We have sown the wind, and now we are reaping the whirlwind. To reverse this naturally irreversible trend to destruction, we must understand more fully the cause. Then we must seek the miraculous solution, which is the spiritually healing transformation of this universal human condition, one at a time, hand in hand, heart to heart. The perpetrators of extreme crimes have become detached from their personal identities and consequently from the reality of life, lost to the deceptive delusions of death walking among us. Crimes such as these are most likely the result of what I will call "Satanic insanity" for lack of better terminology. Satanic insanity is a progressive disease of the mind and soul brought on by an environment experienced as being devoid of love and security. It begins with a mild sense of social alienation coupled with a sense of one's meaninglessness, and it ends with the personal identity implosion that comes as a byproduct of an insatiable consumption of the life force through the administration of pain, torture, and violent death of others until the self descends to its final demise - suicide. Many skip the demonic struggle for power over death and go straight to suicide. I call it "Satanic Insanity" because the extreme behaviors only occur in spiritually obsessed people who are alienated from God. While this may at first glance appear to be contradictory in concept, it is not, for there are two spiritual paths in this world. Either one may create a stable personality or identity, but one of them wreaks havoc when unstable. Either one may bestow benefits to the quality of mortal life, but only one leads to life eternal. I am speaking on one hand of the spiritual life force by which God empowers the natural universe. It is called the "breath of life" in the Bible and symbolized by the Tree of the Knowledge of Good and Evil, Light and Darkness, the Yin and Yang of the Chi, Yetzer HaTov and Yetzer HaR'a, the cyclical ebb and flow of the pantheistic or elemental forces of the natural world. Then there is the Holy Spirit of the Creator's own identity and being. It is the One Spirit of God manifested in the Father, Son, and Holy Spirit of the Trinity, as symbolized by the Tree of Life, the only source of life everlasting as is found scientifically in the dimension beyond the speed of light. This Spirit is only good for its identity is created and expressed in love, truth, and grace. While the identity formation process through the spiritual path of the natural life force is by separation and a creative balancing act by choice from the full range of human experience in good and evil, the identity created by following the spiritual path of the Holy Spirit is one of union with God in the Holy Spirit accessed through faith in Jesus by which personal individuality is expressed through our creatively unique, freely chosen experiences in the practice of a singly defined love nature known as God. Thus, the only love apart from God is love of self, even if it is exercised as and appears by all external evidences to be a love of honest altruism. belief in one's undeserved salvation by grace. God has been pushed out of the daily concourse of western civilization. Our euphemisms for morality and spirituality are destroying us. We think that love and decency are humanistically generative, that is that they are possible apart from God. They are not. Apart from God, man is at best a balance of good and evil. It is true that each of us has come up with a little different kind of balancing act where each seeks to focus attention and worth meaning in what he considers to be a good aspect of character, personality or spirituality. There are enough similarities in our individualistic ideas that whole industries have sprung up to cater to the commercially inspired images of the good life. Most visions of the good life are nothing more than a materialistic collage of temporal spiritualism assembled from a marketed bag of commodified human aspirations. For example, for much of human history wealth has been considered good and the source of what people desire in life. To pursue it is to pursue happiness. Thus, the understood consensus of our social values as expressed in our civic interaction interprets our constitutional rights to the pursuit happiness (by getting wealth) as the only tangible form of human redemption. This is the socially accepted, governmentally administered, philosophic agenda behind the universal belief that if everyone could become gainfully employed and managed their money into prosperity, then we would have no social or personal problems. This premise is untrue. Yes, indeed there are basic levels of prosperity and health which once reached seem to facilitate the contemplation of human consciousness of the more artistically beautiful aspects of life, but physical sustenance is a different issue than the pursuit and value of wealth for its own sake. Redemption of the soul is naturally impossible. Life can be improved, stabilized and brought to an external normalcy within any healthy human culture apart from God's direct participation. This happens often because most human cultures recognize some aspect of divinity. Although taking the external form of godliness learned by experience has social benefits, it is no substitute for the real thing. From the painful richness of human experience, cultures have learned and teach the many of norms and values of goodness, love and discipline, even if their religion is one of secular skepticism. This is what choosing from the Tree of the Knowledge of Good and Evil represents: humankind has discovered much of what is good and evil by its collective experience. We resist pure goodness as unattainable because the natural ego wants to define goodness positively, or by exclusion (It is not …), for himself or herself without divine intrusion. The more sophisticated organize or modify a social entity to confirm as divine the values or behaviors cherished. We inherently insist on defining what is good for ourselves. When we insist on calling some things good by default, it means that other things become less good, or evil to us. The differences between my personal definitions of good and evil and the social entities (religion, party, race, nation and/or state) of my extended identity as compared to other individuals or social groups, inspire various forms of human conflict. The only lasting path to peace among persons and peoples is for all to accept in common the ONE God's singular definition of what is good and embrace it in submission by eschewing what He calls evil. Only then will each of us personally understand and accept our nature as sinners, aliens from God's Spirit, and so find the true freedom of personal identity powered by the Holy Spirit in love's expression of life lived. Children know the difference between professed love and the real thing. They can see through adults with ease. When we become adults, the process becomes more difficult because we have magnified the fears from our sufferings at the hands of others through a process of internal repetition and repression until we lose the natural trust of a child's heart. Many feel beyond the mere loss of trust crossing the boundaries of psychopathy. Some children are much more susceptible to the onslaught of Satanic Insanity than others. It's like some people have an easier time resisting colds or the flu than others. The only way to insure that all levels of psychospiritual health respond, heal, and grow is to take Jesus Christ into the heart of a culture, one person at a time, and as God calls and wills. Satanic Insanity usually begins in one’s youth with a simple alienation from a parent, from siblings and/or other children. As much of this book is a personal interpretation derived from personal experience, I want to emphasize that I am not proposing an exclusive explanation of what happens inside a troubled mind. I am sure that there are variations of symptoms and circumstances as well as motivations, but many of the principle forces are universal. As Satanic Insanity degrades, debilitates and dries out the soul, it destroys one's personal identity by eliminating the security of being alive. Satan's mantric weapon is the fear of death. To overcome their fear of death, devotees focus their attention on the worship, idolization and obsession of death. From dress to song, the practices of the ghetto of death release immediate symptoms from that fear and create a coterie of friends who similarly suffer this insanity and support the addictive practice of hallowing death. One feels like s/he belongs, and a false sense of identity is imparted. But the imparted identity is one of the absence of life, it is the vacant emptiness of death, which prepares the way for total identity destruction or implosion. Much of my content comes from the Bible. 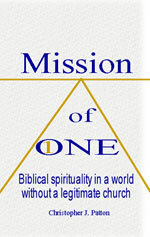 I feel that its contextual background is essential guidance and inspiration in this quest for the Mission of ONE. Bible study has the potential to provide a living understanding of the relationship between God and man with the overview of eons. It is a witness of human nature and the natural fleshly comprehension of the spiritually supernatural. The Bible is also a record of human communication with the God of Abraham, Isaac, Jacob, Moses, and Yeshua/Jesus. The history of Christianity since the Bible is ONE of the philosophical and social developments of Jesus' followers and the organizations they founded as the faith moved from its original cultural context. Furthermore, the Bible promises that one’s knowledge (or theological doctrine) and grace will grow and increase with studious application of its precepts in faith. I believe that growth in grace has not kept pace with that of knowledge for many hundreds of years. Even if ONE accepts that most of the growth in knowledge is soundly based, it is precisely this imbalance or disjuncture which has led to many of the Christian world's social problems, including religion-based conflict. Because knowledge is a mixture of variable truth and mistruths, the human population’s severally paced rates of growth in knowledge about spiritual matters also contributes to the problems of the organized church in all of its sects and denominations. Even if growth in theological knowledge or doctrine would be totally sound, we should still expect changes in the expression of the organized Christian church's doctrine and practice as it progressed through time and into different cultures and geographical areas. We should not expect to find explicit documentation of the loss of miracle causing spiritual power in the pages of the Bible, but rather discover it in the history of the church. The Bible at best can provide some clues useful in understanding or explaining why growth in grace has lagged - perhaps what even promoted its first and most serious constraint, but not more. The Bible can guide further study in non-biblical sources, also - but again not more than guide. I propose that the church lost the driving force for deep growth in grace when it lost the mystical fellowship between her members, which is something that came decades after the biblical story and letters end. The complex of religions classified as Christianity has grown out of the residual spiritual impact of Jesus' life melded with sociocultural forces in interactive synthesis over hundreds of years. Thus, Christian civilization has been partly steered by the divine miracle of inspired thoughts and deeds as well as by the individual and national struggles for physical survival common to all. Without the continuing presence of Godly might the universal Christian church has succumbed to increasing competition for secular based force. Struggles within the church seemingly focused on doctrine, but the real issues were ecclesiastical and political power. Power produced wealth for the church and its leaders. This is where most of the large buildings came from: they were architectural expressions of political power and wealth more than functional places of mission and worship. These struggles spawned the many Christian denominations we find around the world today. These historical religious conflicts and wars actually had little to do with the spiritual matters of eternal life in heaven or hell. They were mostly initiated, fought and terminated over economic and political issues. Religious doctrine was utilized to draft the masses to the designs of the contesting rulers. Millions suffered and died in the name of God, but they mostly did so for their leaders’ greed and ego-lust for power. Another casualty has been salvation: salvation became an issue of doctrine rather than ONE of the graceful presence of the Holy Spirit. In order to motivate the masses to commit their mortal lives to the purpose of their overlords, salvation by orthodoxy became the gospel. Orthodoxy meant that adherence to and profession of correct doctrine (or knowledge) as judged by the authoritative (and usually “apostolic”) church hierarchy and its allied militant prophets often canonized as saints. Consequently, a person’s conforming submission from a behavioral and mortal perspective became the determining factor of whether a person was considered “one of us” and qualified to enter into God’s realm. Thus, obedience to a church elite’s determined orthodoxy became the qualification for salvation in the place of Jesus’ gospel message of simple hearted repentance and faith. Even more common than religious wars have been the innumerable lesser doctrinal struggles between rival denominations that were conducted using this same strategy of endangered salvation. Every individual and group has biases. I have biases. Some are more honest about them. Generally, I have found Catholic and Jewish scholars to be more open about their biases. Such admission makes their research more dependable and usable. As a general rule, Protestants are less so. I suspect that this is because Protestant scholarship is often bound by a requirement of biblical legitimization for any theological opinion. Such a phenomenon is logical for a movement that has rejected an inherited ecclesiastical authority for being corrupt and untrue to biblical teachings. Many Protestant denominations originated in sincere attempts to reform recognized failings in organized Christianity by seeking to more perfectly duplicate early church worship with its quality of belief and religious life. Their memberships often endured martyrdom and unwarranted persecution for their efforts. At best, Protestantism came close to the early church in a limited number of aspects. For example, most Protestants will attempt to prove general Sunday observance by the early church by the Bible. It can't be done. Catholic scholarship admits changing the day of weekly worship from the Saturday Sabbath to the Sunday Lord’s Day in conjunction with the shift from the orthodox observance of Passover to Easter. In historical context, the Roman Church made these changes in response to two Jewish rebellions against the Roman Empire in an effort to distance non-rebellious Christians from the troublesome Jews. Most Roman Christians did not want to be considered as Jewish enemies of Rome subject to persecution, torture and death, so they eliminated a few of the more obvious Jewish signs of their religious origin. Over the years, additional Roman customs and organizational concepts were integrated into the orthodox liturgy and hierarchy. Catholic scholars document and admit the existence of opposition by some early church leaders who followed traditions considered “Jewish” simply because those were the traditions taught and practiced by the first generations of disciples. In fact, Catholic scholars recorded decades of details about the battles between competing theological camps concerning changes in tradition and doctrine, such as the shift from Sabbath to Sunday and from Passover to Easter. In the western world today, Messianic Judaism is the largest Christian movement that intentionally chooses the traditions and flavor of the early church. This global movement of from 600,000 to one million Jewish and non-Jewish members makes an honest attempt to capture the spirit of the early church with admitted accommodation to modern life. Their doctrine is a prayer shawl (talit) tapestry of individually professed, mainstream evangelical concepts bound together by a culturally and spiritually Jewish context. The evangelical perspective of Messianic Judaism is to take the gospel first to the Jews and then to all nations without prejudice. Besides Messianic Judaism, there are many smaller movements and independent congregations who seek to do the same, albeit they range widely in how their attempts are explained in theory and lived in community. For almost two thousand years religious life was frequently a good life - the obvious exceptions being the countless number of religious wars and local pogroms. But this very strife demonstrates that the world remains incompletely changed despite the huge initial impact of the gospel. Human psychological and social experience still falls way short of reasonable ideal. Historical changes in religious ritual and/or in doctrinal format did not heal the spiritual body of Jesus, nor have most attempts to return to early messianic traditions. At best these changes led to some honest repentance and changed lives: true spiritual fruit. In their lasting impact, however, the zeal, which accompanied some change in a denomination’s understanding, has at least generated some growth in the number of their own registered members. Because the modern world trends toxic materialistic, most people’s search for a good "quality of life" struggles to become a meaningful substitute for true spiritual congruence of life. “Quality of life” struggles to replace spirituality because without a divine miracle, human nature remains unchanged as an imperfect and indivisible admixture of good and evil, truth and lie. A life founded on a materialistic value and substance foundation is doomed to deny deep satisfaction. Furthermore, one’s personal identity is secretly under attack. Popular psychological advice tells the masses to hide ourselves from the most humanly pervasive, underlying, foundational insecurity in life, which is the absolutely inevitable end in death; therefore, we are deceitfully self-imprisoned by our many drives for self-preservation. Within both secular and religious societies, spiritually oriented individuals have intermittently appeared over the past centuries to lead others by the example of their lives. These individuals led more by who they were than even by what they did or taught. Each has communicated his or her life example in a different medium, be it through religion, through artistic expression or through sociocultural institutions and experiences.